The inevitable time has come again when something old is cool again. No i’m not talking about those pair of JNCO jeans you’ve been holding on to, i’m talking about them sweet sweet VHS tapes. Unless you are a VHS elitist then you have probably long stopped caring about tapes. It’s dead media unless you are part of the few that stayed or the ones returning to the format. I for one mainly collect horror tapes (horror anything for that matter). There were many movies that were left behind and never got to make a transition to DVD. Though finally we are starting to see some of them being produced on Blu-ray. This is not a top 5 of my VHS only movies, just a top 5 of my favorite movies on VHS in my collection. Lets GOOOOOO! Roddy Piper was and still is a badass. They Live has to be one of my favorite sci-fi flicks of all time. I stumbled upon my copy of this film at my local Goodwill. Someone graced their entire VHS horror collection on to the store. I was lucky enough to stop in on my lunch break and by chance I found what was left of it. The lady working the counter said there had been a lot more, but it was mostly picked over. This gem takes place in the post apocalyptic future where infertility runs rampant. Sam Hell (Roddy Piper) is a prisoner of the women who run the USA after the nuclear war. 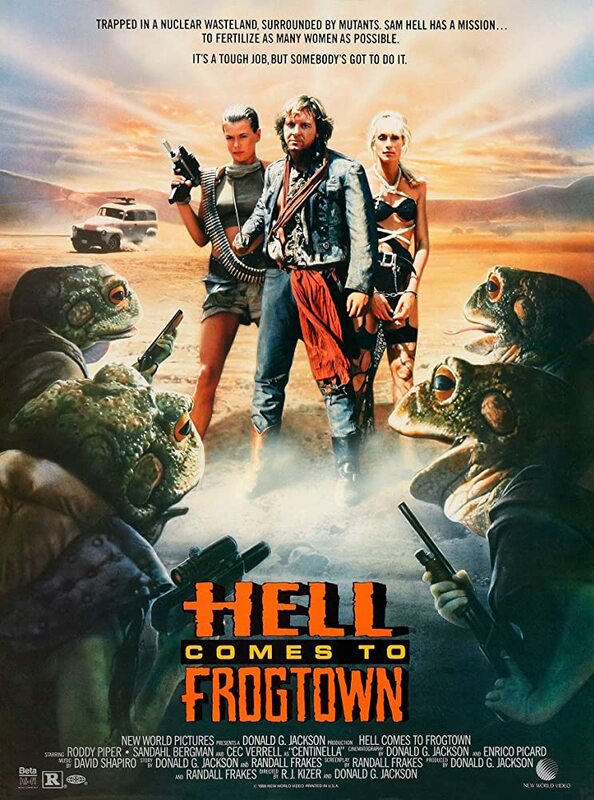 He is tasked with mission of rescuing a group of fertile women from a group of mutants that resemble frogs. Attached to his junk is a bomb that they will detonate if he strays too far. It’s is all a parody of Snake Pliskken pretty much lol. Slithis is about a mutant sea creature that spawns from the waters of California after a nuclear material leak. It’s a lot like Creature of the Black Lagoon but with blood. This movie has bad ratings about everywhere you look but I really love it! H.P. Lovecraft is my ish. Been in love with his writings for a long time now and still have yet to finish all of them. I like to savor them like a fine wine lol. The way he wrote was really against anything else going on in his time and I really respect that. From Beyond and The Outsider are my favorites, but Dagon is right up there too. I always wish that a big budget company would do a few movies on his writings. That’s not to say that Dagon, Re-Animator, From Beyond and the rest are bad films. They are goo each in their own but I want to see it over the top. 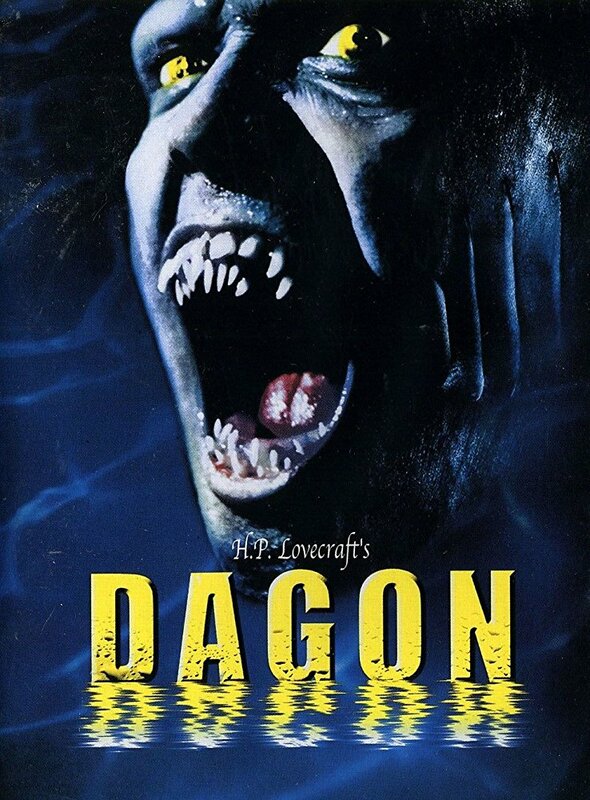 Dagon is about a couple that suffer a boating accident by a fishing town that forces them to run ashore. They soon discover that things are a bit different in the town. The streets are overrun with the half human offspring of one of the old ones (ancient gods). They use to run this movie a lot on the Syfy channel back when it was the Scifi channel and played good movies. Okay so this movie definitely didn’t get stuck in the VHS era but it is one of my favorites on VHS none the less. My copy is still the same damn TV bootleg I recorded when I was a kid. I had to get a actual copy recently though because the lines were just getting way too bad. Either way I can’t help but prefer to watch this movie on nothing but VHS. There is some kind of connect you get when you pop the tape in and everything is just the same as you remember. That’s time travel right there and you can’t beat that.. except for you know.. actual time travel. If you don’t know what a Graboid is then you have been living under a rock (pun intended, go watch this movie right now!). 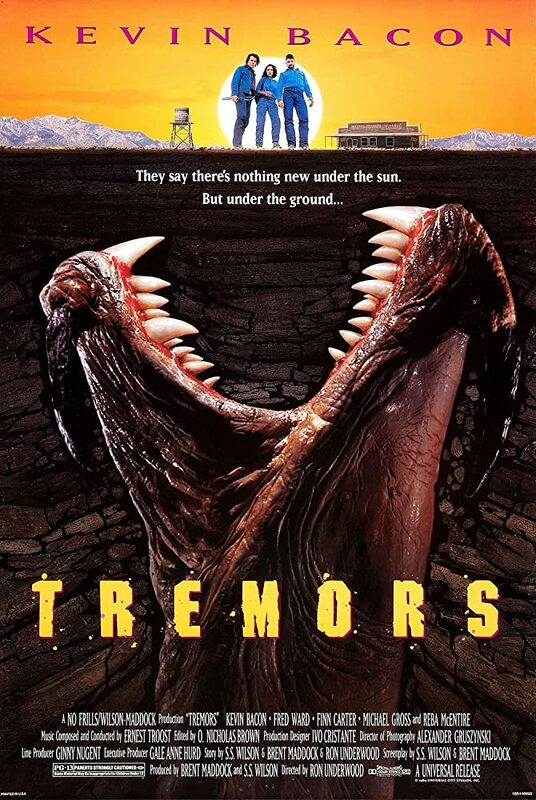 Tremors is a small town monster movie, but ain’t they all? The town is attacked by underground creatures who strike at what ever moves above the surface. The towns natives must decide to fight or flee with places to hide running scarce. Was pretty happy to get this VHS in a exchange with a friend recently. Nothing like having the original format to watch one of my favorite movies on. It takes me back to a simpler time with my best friend when we rented movies every weekend and played with our G.I. Joes. 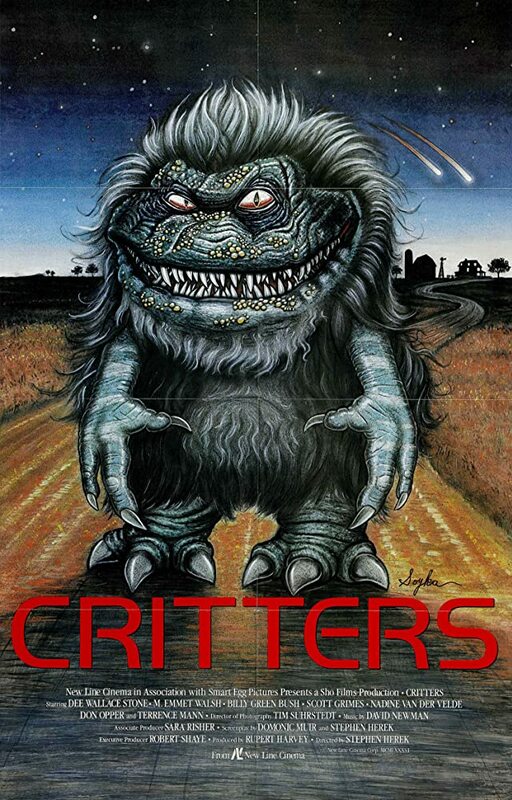 Critters is the movie that made me stop dangling my legs over the end of the bed at night in fear that the Crites would shred my feet off lol. It also made me fear cubby holes and really anything else a Crite could stow away in. That was the most effective part about the little buggers is that they could literally be anywhere. Seeing this as a kid was scary but now it’s comical as a adult and I can now appreciate the adult humor in all of the movies. Fun fact that a lot of fans know but you dear reader may not, is that Critters 3 was the debut film of Leonardo DiCaprio. The more you know lol. Critters go figure takes place in a SMALL farming town. I guess creatures can only attack SMALL towns lol. One by one the locals are picked off by the little fuzzballs from space until one family with the help from the intergalactic hunters stand against them. This was also the first violent movie my mom allowed me to rent. She was really big on the age ratings on the films so getting to rent this movie way below the 13 rating was a big deal for me and I ate up every minute of this movie. So a lot of the movies in my VHS movies collection that mean a lot to me are not rare. They have been released in newer formats and some are pretty common (I’m looking at you my OG Jurassic Park copy). But isn’t that what collecting this stuff is all about or should be about, collecting what makes you happy? I have the Blu-ray of Ghostbusters but it’s all polished and pretty and you can really see the CGI.. like REALLY see the CGI. The VHS format hides some of that and bottles all that sweet movie magic we all remember. May VHS live on forever! Liked it? Take a second to support Nathan Smith on Patreon! 5'11" Male w/ hazle eyes Looking for open minded, pizza loving companion with cats. Likes: Long walks off short piers and yelling out car windows at locals. Perks: +2 Agility +5 Taco eating +9 Dissapointing your parents in your life choice of knowing me. Dislikes: Searching for the remote, finding the remote but missing one battery and at last finding the remote with both batterys but missing battery cover so you have to use a old piece of tape that eventually falls off and leaves your hand sticky from the residue it left behind. #givehertheDoomblade ASL?